This cutting board from XOTC is made of solid smoked oak. Milled recesses in the sides makes it easy to lead a plate under the board and easily push over chopped food. Removable leather handle makes handling easier and provides a decorative styling to this solid piece of kitchen tool when it is on display in the kitchen. 300x300x40 mm. weight ca. 2 kg. 500x300x40 mm. weight ca. 4 kg. 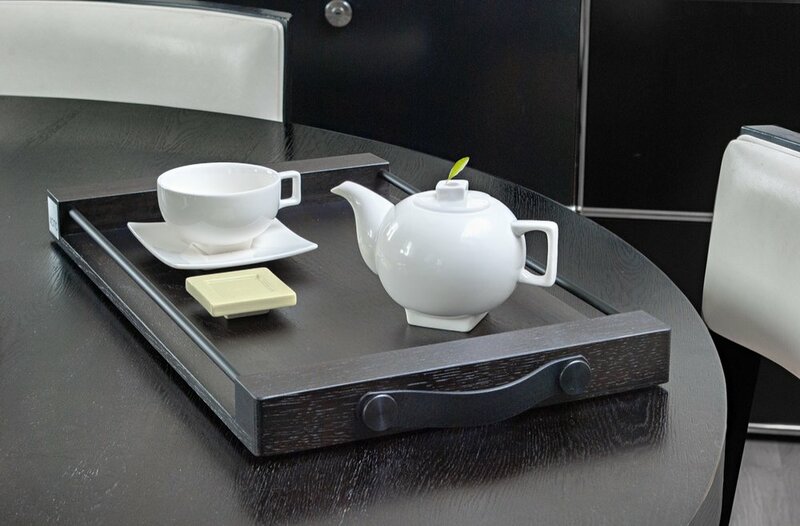 The combination of black oak wood, leather handles and black aluminium rods makes this tray something special. The tray will be a great everyday household utensil while at the same time expressing its design and decorative styling in every home. Aluminium rods on two sides adds a certain design element to the minimalistic look. 500x300x40 mm. weight ca. 1.7 kg.